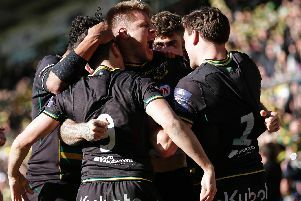 Supporters are told to assume it is business as usual at Franklin's Gardens as Saints battle to beat the weather - and Sale - on Saturday. The club's stadium staff have been working hard to ensure the sub-zero temperatures and snowfall do not force the Aviva Premiership fixture to be postponed. The Gardens pitch has been covered all week, with a hot-air dome keeping the playing surface from being damaged. Car parks A, B, C, and D and the supporters village have all been gritted every day this week and will continue to be treated until Saturday, as will the gangways around the ground. Meanwhile, Northampton Borough Council will continue to grit the roads surrounding the Gardens which provide access to the stadium. And the club now has a snow plough in action to clear any obstructed car parks or gangways. The groundstaff have been given an extra tractor and trailer to facilitate the snow clearing effort, as well as extra shovels. And extra staff have been recruited to help out at the Gardens on Saturday morning. The shop and ticket office will be open from 9am as usual on matchday, while the supporters village, stadium and bars will open at 1pm in time for the 3pm kick-off. So, all supporters travelling from both Northampton and Sale are told to assume it’s game on at the Gardens on Saturday. But fans are also advised to check the club's social media channels and website (northamptonsaints.co.uk) on the morning of the match for regular updates.